Looking for a particular machine? Ask for it here! Hi folks, since I got my Jennings Dutch Boy I feel the need to add another I would like to find a quarter castle front here in Florida, with all the nightmares I have read about shipping these with the the gorillas I'd rather pickup. I am on the gulf coast below Sarasota, but will go most anywhere in Fl. Looking to buy or barter. Working condition preferred, willing to restore a complete machine. Thank you! I have a few machines that need restoration; they are not Castle front nor 25 cents but I am in Miami. If interested call me 305-947-7744. Thanks ToyDoc, but I need find a quarter machine as my wife's hands have a hard time with the smaller coins. I would have liked to get a dime machine to go with my nickel one, but she likes to play once in awhile and the larger coins would be helpful. I guess a 50 cent machine would be fine, but will they work with today's coins or would I have to find a couple of rolls of older coins? 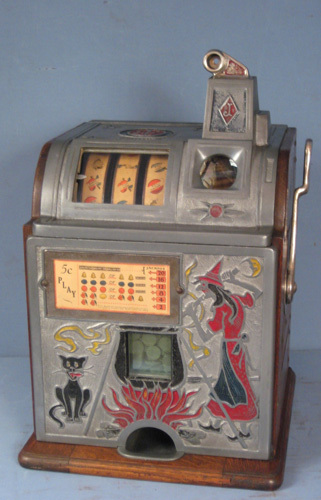 Old Gunner wrote: Thanks ToyDoc, but I need find a quarter machine as my wife's hands have a hard time with the smaller coins. I would have liked to get a dime machine to go with my nickel one, but she likes to play once in awhile and the larger coins would be helpful. I guess a 50 cent machine would be fine, but will they work with today's coins or would I have to find a couple of rolls of older coins? Mills 50 cent machines will work with Kennedy 50 cent coins. Thank you Old Slotman! I Should amend my request then for a 25 or 50 cent Castle Front in FLA ! Old Gunner wrote: Thank you Old Slotman! I Should amend my request then for a 25 or 50 cent Castle Front in FLA ! correctly, because of the difference in coin thickness. Good luck with your search. 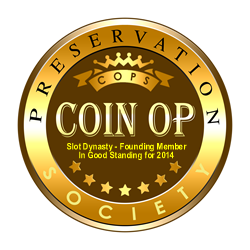 slot dynasty is correct, be very cautious, check it out before buying it. I don't recall seeing a 50 cent version or the British 1d version but , no doubt they do exist. best of luck on your search ! you sound determined, so it shouldn't be long. Thank you gentlemen for the great advice! I am still kind of a newbie at this. After I found the '28 Jennings at a decent price and cleaned it up I kind of got hooked. I am hoping that once I get the quarter machine in so my wife can play I will be able to sneak a dime one in along the line! I really appreciate you folks taking time to give me the pointers! I am prowling Craig's list, that where I found my first one, in the same town I live in! You never know, I am going to try and avoid eBay if I can.